We have recreated Starcraft and Starcraft:Broodwar Campaigns in a 2 player cooperative style, AI have been given a harder difficulty to compensate for two players. Download Separate campaigns individually from the addon's page, Download all of the maps in a single download or just starcraft or broodwar on the downloads page. Enjoy! Tested and working with HD Remastered version of Starcraft. We wanted Starcraft to be cooperative from the moment we found out we could gain access to the campaign maps, since then we have been working to achieve a full on cooperative experience. Every single mission from start to end is cooperative, even if you lose all of your unit's the other player still has a chance to get victory for the both of you though unlikely. In a very few select missions you will have to work hard to work together as you start off with bases on opposite sides of the map, these can be very challenging but extremely rewarding as you get the sense of saving your friend from their demise. We wanted dynamic game play for each and every level, keeping in mind that each level is cooperative and thus every level will be dynamic depending on who you are playing with for example playing Starcraft with your dog will be much harder than playing Starcraft with your friend. In a few missions there is some dynamic events that may occur, for example in Protoss Broodwar mission 8 overlords will spawn units when they go to attack the temple, each time you play the mission regardless of who you are playing with the mission will play out differently as the AI is not scripted to move in and drop things automatically but by chance this means it will give you a dynamic outcome rather than the exact same thing each time, now thats probably going into a bit too much detail on the dynamic elements but just for the sake of it just know its going to be different each time you play. We believed that the stock AI difficulty was beyond too easy especially with two players, we have increased the difficulty in each and every map so they are all nice and challenging. Once we have completed every campaign mission we have also released a second version of all the maps with full insane AI for those who want the ultimate challenge and an EZY Mode for those starting out for the first time with StarCraft that is slightly harder than default. Every level has been scripted entirely for two players, doesn't matter who's in the lead on a non base map who ever gets to the location first will start the triggers. Both players will get victory on every level if the victory conditions are met, same with defeat. All cut-scenes have been scripted to allow two players to watch/hear all dialogue and events, with a few levels with improved scripting to give a much nicer cut scene we don't leave anything out. Each level has been tested over and over again to get the best result for AI Balancing, we don't want it to be too easy or too hard, we want the game-play to be challenging and rewarding, i feel that we have accomplished this with all the testing and AI changes we have made throughout the levels. Various levels have been given improved AI scripting as a result of either bugs or difficulty, for example Original Terran 3 has been given above and beyond the default scripting to the point its almost insane compared the original solo campaign mission, in this map a lot more units will attack from the start to the end, each wave has been designed to attack the right place at the right time and in the end, if you haven't seen it from our youtube videos i wont wreck it for you but things get extremely overwhelming much like an Archon the Zerg will overpower you and push you back, if your defenses aren't up to scratch they will wipe you out. For all of those operation type game types we wanted players to feel like even if they are falling behind they can catch back up, by default all of the units you gain are set to Rescue-able so if you had a player running full steam ahead they would by default get all of the units, to stop this from happening we have created triggers to give 50/50 units for each player. With our 50/50 triggers in place it means if you do run full steam ahead and lose all of your units, the next group of units that gets rescued, you will get half of them getting you back into the game. With these triggers in play it gives each non base mission a feel of being equal and in the unfortunate event of losing all of your units, the other player can proceed on and eventually get you some new units. Every map has been thoroughly tested from start to finish, this includes unit/base/resource placement, AI balancing, resource balancing, dialogue for both players, victory conditions, defeat conditions, triggers, sound, cut-scenes, mission briefing, unit upgrades, units available, special abilities available and everything else i cant think of, we make sure we have found and fixed every bug we can find before releasing each map.I hope you have enjoyed reading this overview of all that we have done for the mod, as always Enjoy! An overview of all that we have done for the mod, listing key features that have made the cooperative experience an enjoyable one. Starcraft Co Op mod preview! We believed that the stock AI difficulty was beyond too easy especially with two players, we have increased the difficulty in each and every map so they are all nice and challenging. Once we have completed every campaign mission we will release a second version of all the maps with full insane AI for those who want the ultimate challenge. Starcraft Co op Campaign updates! 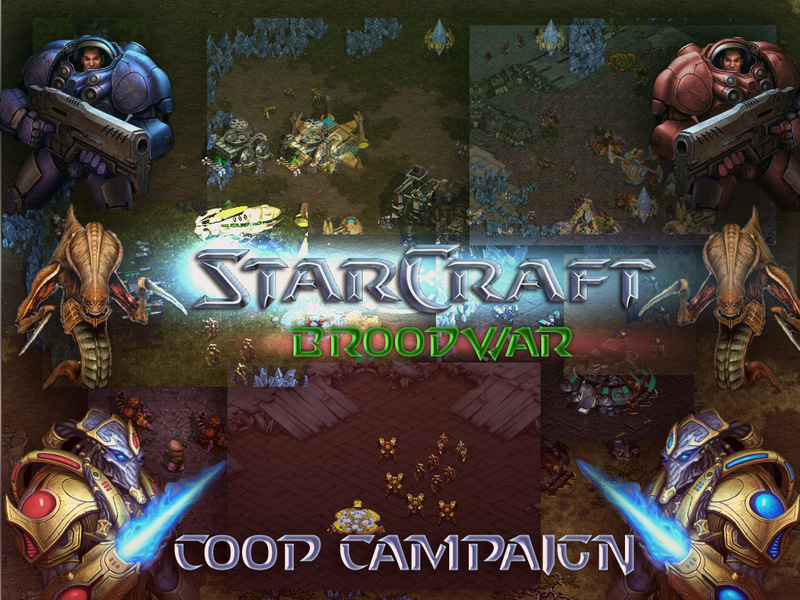 Starcraft Coop Campaign Mod has been featured on multiple game sites letting a larger audience know about what has been created. Starcraft Broodwar Protoss missions are now fully scripted, tested and uploaded. We have completed yet another milestone! Starcraft Broodwar Full Zerg Campaign, fully scripted and tested. Enjoy! Where would one be able to find players for this? I've tried searching reddit, I often have a game open to public in the lobby, but no one seems to join. you have no idea how grateful i'm with you doing this mod for campaigns. I always was looking for campaigns in a hard mode. They originally are too easy if you have played them a couple of times (even for a casual). I'm really enjoying thus far the terran campaign in sc1 vanilla. By the way I wasn't able to find any people interested at playing it. This mod is so huge, really dude. Would love to play it a lot more. I don't suppose anyone is still interested in playing the Co-op maps? Have a grand day otherwise. If you're a veteran -> download! Confirming, works flawlessly with Remastered. I bought Starcraft the day it launched 20 years ago and most sincerely thank you for the effort put into these maps. I consider myself a true veteran and found these maps challenging and equally rewarding, I often finished with under 100 spare crystal. I'm glad to hear you enjoy them! Are there plans for updates on the BW co-op campaign or on the insane co-op versions? The version number is based on each respective version, they're all currently using the same level of logic/bug fixes. the insane co-op version was nerfed shortly after we created it as one mission was near impossible. If we are playing Stacraft Remastered, will the campaign audio (campaign dialogues and briefings) be upgraded or will the audio remain the same original 1998?